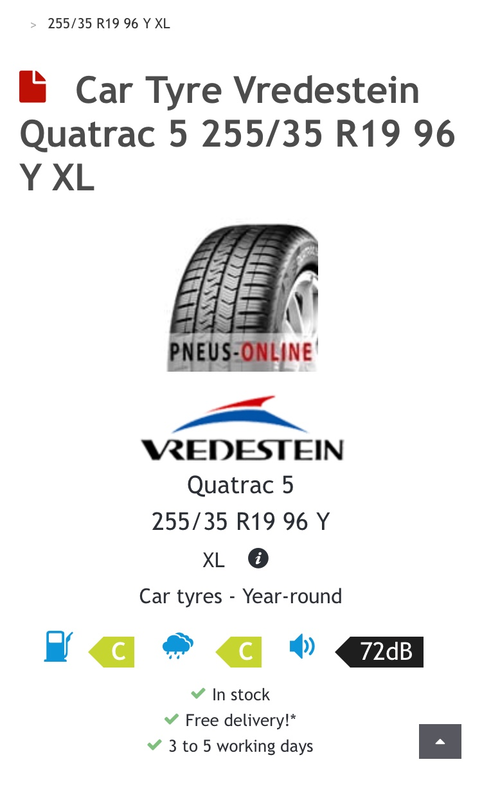 Just wondering what people are replacing the standard tyres once they need to be replaced. i assumed R18's would not fit 19 inch rims? No the won't, have you looked at the tyres themselves that are fitted? Any pictures of your car yet? Technically you can but your speedo will under-read by about 3.61%. So at 30mph it'll only be telling you 28.92mph and at 70mph it'll only be telling you 67.47mph. Something to be aware of. Why would you want all season tyres? They are not as good as summer tyres in the summer and not as good as winter tyres in the winter. In fact they are below average all year round. Best to stick to the correct tyres on a performance saloon IMO. Also you have Quattro so I’m sure a decent tyre like a Goodyear assy 3 or Michelin pilot sport 4s or even hankooks and the contis will be fine all year around. Just when you get snow you may struggle. Ermmmmm....have you ever tried the Michelin Crossclimates? Living in North Scotland where the Winters can be pretty harsh, they were 95% as good as my dedicated Winter tyres on my B7 and 100% as good as my dedicated Summer tyres. So yes, the latest all-season tyres are pretty darn good and I would love it if Michelin could produce the Crossclimate in 245/35/R19 size. Otherwise its back to the Nokian A4 winter tyres for my B9, which are brilliant Winter tyres. You don’t tend to get big sizes in these sorts of tyres unless you want to spend stupid money for a set of 19” winter tyres. They tend to be smaller to cut into snow. I will be running 17” in the winter 225/50/17. All season with summer bias because we don’t get bad winters.